Home » Arizona » Debbie Lesko an Education Supporter? Not so much. Republican Debbie Lesko is running to replace her friend, disgraced US Representative Trent Franks, in the House of Representatives in an April 24 special election. Lesko enjoys the luxury of an extremely conservative District 8 that voted for the current president by a 21 point margin. Her opponent, Dr. Hiral Tipirneni with a moderate platform and innovative ideas for healthcare coverage reform, faces an uphill battle but after two televised debates has eroded that comfortable 21 point lead by two thirds down to an impressive 7 points. Lesko has refused Tipirneni’s invitation to a public debate. Perhaps because of this rapid decline in a comfortable lead for their candidate in the face of similar results in Pennsylvania where the Democrat Conor Lamb won, the GOP is suddenly infusing massive amounts of cash ($551,250 at last count) in an attempt to rescue Lesko from the same fate. 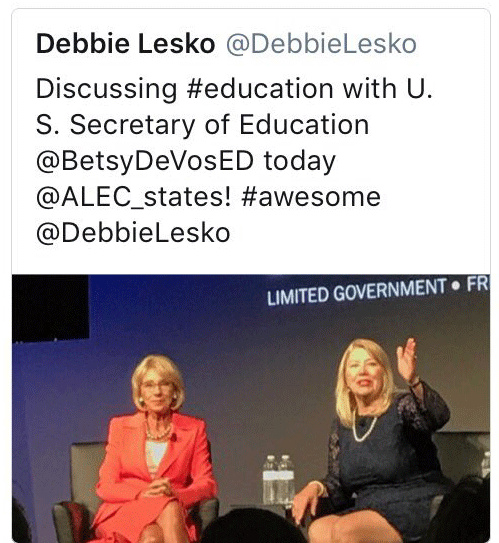 Lesko presents herself as a big supporter of education. She is not. She is, instead, simply a supporter of “school choice”, not necessarily education improvement. She is a board member of the American Legislative Exchange Council (ALEC), a conservative organization with lobbyists writing legislation to be introduced by friendly legislators. There is no ALEC position, and thus no Lesko position, regarding education other than support for voucher based distribution of education funds whether they are sourced by local or federal funds. As a good ALEC soldier for ALEC, Lesko toes the ALEC line without question. There are clear arguments for and against voucher systems, charter schools and some privatization of education have worked in some circumstances. There are other examples where voucher based systems have failed miserably. In Arizona, there is a hard won ballot measure coming up for the voters of Arizona to decide whether they wish to further expand the ESA (Empowerment Scholarship Accounts) system which allows reallocation of education funds for certain students. Lesko and Arizona Governor Ducey really did NOT want the voters to have a say in this matter reaching a ballot. ESA accounts were initially provided so children with learning disabilities or other extraordinary circumstances could garner assistance finding educational offerings better suited their needs. Lesko and ALEC then expanded the program to be available to everybody, including parents already sending their children to expensive private schools. Arizona has the most broad reaching implementation of the ALEC (and Koch brothers) school voucher program in the country since 2011 and yet remains near the bottom of every meaningful ranking of K-12 education. Rather than rehash the ESA question here, please read the March 28 New Republic article “Is Washington Ready for Another Betsy DeVos?” which is professionally written and lays everything out in clear detail. There’s an education crisis in Arizona, mostly related to funding and partially because of funds bled out of the public education system to support private and charter schools through an ESA system with incredibly non-existent oversight. Something like 800 teachers have quit in Arizona since the current school year began in August, 2017. Teacher pay in Arizona is notoriously low including stories of a teacher with a master’s degree and 11 years of teaching experience pulling down $40,000 a year while listening to insults from politicians about teachers spending the summer on their boats. Governor Doug Ducey vetoed a bill (SB 1209) that had wide bi-partisan support regarding changing the performance measurement requirements for Arizona teachers to put less emphasis on student standardized test performance with more emphasis on measurable teacher performance metrics. Teachers were even being evaluated based upon the performance of students they didn’t teach, clearly an unfair practice. Only ONE state senator voted against the bill… Debbie Lesko. Is there a direct correlation between losing SB1209 and the outflow of teachers from Arizona schools? Probably not, it’s more a “one more nail in the coffin” thing combined with a budget slashed years ago and funds being replaced begrudgingly and too slowly to get Arizona out of the bottom rung neighborhood measuring school effectiveness. Debbie could have voted for SB1209 and still had the result she wanted because she knew Doug would veto it. She would have had some plausible deniability for an unpopular vote. In some regard. you could begrudgingly respect that desire to send a clear message about your position. But, is that position solely based upon whatever ALEC decides should be her position? Her answers regarding her vote on SB1209 leaned toward her belief the proposed changes “dumbed down” teacher evaluation. Doug Ducey was nearly the only other legislator in Arizona agreeing with that position, for what that’s worth. The Arizona Education Association posted “Governor’s Veto Confirms Pattern of Disrespect for Arizona’s Teachers and Students” after the bill was rejected by Lesko and Ducey. Local columnist EJ Montini penned “Ducey bashes teachers one last time” and there are plenty more entries available at your fingertips if you choose to use your favorite search engine. For what it’s worth, Lesko was awarded a 38% grade on her “legislative report card” in 2009 by the Children’s Action Alliance. Giving lip service to education as a priority is belied by Lesko’s record. Her voting record is ALEC driven and highly slanted toward tax cuts. Since education is a big consumer of taxes, her goal is to reduce those taxes at any cost including the education of her constituent’s children. “School choice” sounds like something hard to argue with and don’t we all love tax cuts and deciding how our remaining taxes will be spent at a micromanagement level? Of course we do. In practice, however, the results are mixed at best. 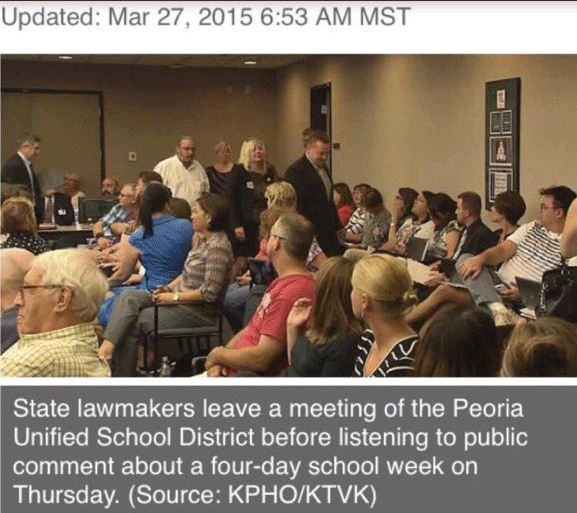 In 2015, Lesko causally smirked and walked out of a Peoria School District meeting rather than hear what her constituents had on their minds. 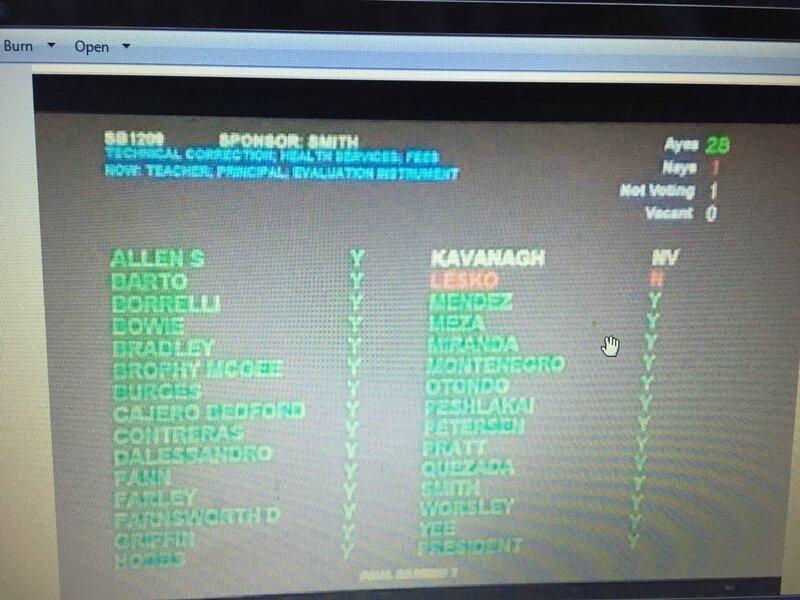 Despite voting “no” on SB1209 because she didn’t want to “dumb down” teacher measurements, Lesko enthusiastically supports the rise of charter schools and threw a bunch of money into charter school (including at lest one that declared bankruptcy) coffers with her ESA expansion plans. Charter schools have very little oversight, financial or otherwise. Teachers in those charter schools aren’t required to have a state teaching certificate. The budget cuts so enthusiastically supported by Lesko and the subsequent exodus of qualified, trained teachers have resulted in desperation for ANY teacher to stand in front of a classroom. This forced the state to issue emergency certificates to people without ANY training as a teacher. Ask Debbie about some of these subjects if you see her in public and she says anything about how supportive she is of education. Encourage her to have a public debate with her opponent to help clarify each candidate’s positions.